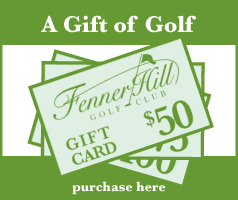 Join Fenner Hill’s 2015 Loyalty Program. The more golf you play, the more free rounds you earn! Play 10 rounds and get a round free! Earn points at Monday – Thursday, 6am – 1pm and Saturday,Sunday & Holidays 6am-7am, 11am – 1pm. Redeemable Monday thru Thursday 6am – 1pm for Golf ONLY. Carts $17. Earn points for playing Sat/Sun/Holidays 7am-11am . Redeemable ANYTIME except Fridays! Golf only, Carts $17. Pick your card up, earn points and redeem them in our Pro-Shop!